This example will create a single appointment, then define a recurrence rule that occurs every two hours for ten occurrences. In the example you will change the background and status for a subset of appointments that occur after 10AM. 1. In a new application, add a RadScheduler and two RadListControls to the form. Place the RadScheduler on the left half of the form and the two RadListControls on the right half of the form, one above the other. Name the first list box "lcAll" and the second "lcAfter10". // Create a sample appointment that starts at 10/1/2008 3:30 AM and lasts half an hour. 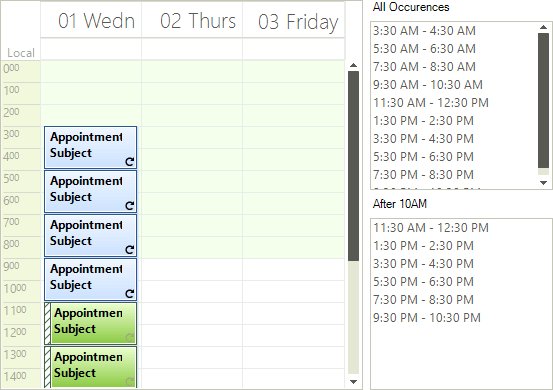 // Create a recurrence rule to repeat the appointment every 2 hours for 10 occurrences. // set the background id to "Important" and make this occurence an "Exception"
' Create a sample appointment that starts at 10/1/2008 3:30 AM and lasts half an hour.
' Create a recurrence rule to repeat the appointment every 2 hours for 10 occurrences.
' set the background id to "Important" and make this occurence an "Exception"
3. Run the application. Notice that the background and status for appointments after 10am are changed to reflect changes made to members of the collection returned by GetOccurrences().